The spectacular "blood moon" total lunar eclipse of Oct. 8, 2014 is captured by photographer John W. Johnson of the Omaha Astronomical Society in Nebraska in the United States. As the full moon shines in the night sky tonight (Sept. 27), it will pass through Earth's shadow in a total lunar eclipse. You can watch the lunar eclipse in a webcast by the Slooh Community Observatory. You can also see the total lunar eclipse webcast on Space.com, courtesy of Slooh. 1) How often do lunar eclipses happen? During the 21st century, there are 85 total lunar eclipses; a specific geographical location on the surface of the Earth will be able to see an average 40 to 45 total lunar eclipses or about one about every 2.3 years. Contrast this to a total eclipse of the sun, which, as seen from a specific geographic location occurs on an average of once every 375 years. When the Earth's shadow sweeps across the lunar landscape, the temperature drops radically. In fact, the resulting "thermal shock" may cause lunar rocks to crumble and gas to escape from within the moon. Normally, as the sun slowly sets on the moon, the drop in temperature is gradual. But if sunlight is shut off when the sun is high in the lunar sky, the drop is much more rapid – over a span of just 10 to 30 minutes. During a total lunar eclipse in 1971, temperatures were monitored at two Apollo landing sites. At the Apollo 12 site on the Ocean of Storms, the temperature dropped from 168.3 degrees Fahrenheit (75.7 degrees Celsius) to minus 153 degrees F (minus 1021 C), a 321.3-degree change. At the Apollo 14 Fra Mauro site, the temperature dropped from 154.1 degrees F to minus 153 degrees F (67.8 degrees C to minus 102 degrees C), a change of 307.1 degrees. Interestingly, infrared images of the eclipsed moon have revealed literally hundreds of "hot spots" as well as large areas on the lunar surface that were warmer than their surroundings. Scans of some prominent craters, such as Tycho, seem to suggest a heat-release pattern caused principally by stored solar heat rather than heat from the moon’s interior, while other craters, like Gassendi seem to show the sort of thermal behavior that one would expect of an internal heat source. Although this phenomenon has been studied for over 50 years, and several theories have been put forth to explain it nobody has determined a definitive solution as to why such hot spots" exist when the moon is completely immersed in the Earth's dark shadow. The longest duration of totality for a lunar eclipse is 106 minutes. This can happen when the moon crosses through the middle of the Earth's shadow when the moon is at or very near to apogee (farthest point in its orbit from Earth). When the moon is near apogee, it is moving slower and needs a longer time to cross the Earth's shadow. In addition, the longest total eclipses tend to occur during the Northern Hemisphere summer, when the Earth is near aphelion (farthest point in its orbit from the sun). When the Earth is in the aphelion part of its orbit, its shadow is a little larger than when the sun is closer to us, resulting in longer lunar eclipses. 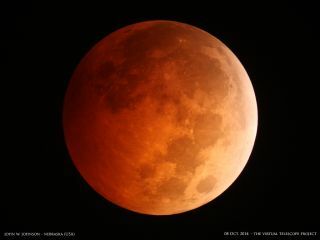 The total lunar eclipse of July 16, 2000, which was visible in the Pacific Ocean, eastern Asia and Australia was one of the longest on record, lasting 106 minutes and 25 seconds. On Aug. 13, 1859, totality lasted 3 seconds longer. It won't be until Aug. 19, 4753 will there be a longer total eclipse, with a duration of 106 minutes and 35 seconds, according to "Mathematical Astronomy Morsels II" by Jean Meeus published by Willmann-Bell, Inc. in 2002. 5) Can total lunar eclipses foretell the end of time? In recent years, a new term for a total lunar eclipse has been bandied about in the mainstream media: "blood moon." The term came from a book that was written by a pastor who claimed that beginning in April 2014, a series of four consecutive lunar eclipses – coinciding with Jewish holidays– with six full moons in between, and no intervening partial lunar eclipses, is an omen of the end times. The eclipse series is called a lunar tetradand is very variable with time. The Belgian astronomer, Jean Meeus points out that no tetrads at all occurred at the time when Louis XIV was king of France, yet from 1909 to 2156 there are 16 tetrads. And during a 2,000 year interval, 25 of these began in between March 16 to May 15, meaning that there have been other periods in history where tetrads coincided with the Jewish holidays, yet nothing out of the ordinary happened! So the "Blood Moon Prophecy" is nothing more than a fallacy and should be filed away with the nonsensical prediction that"Rapture" and Judgement Day was to take place on May 21, 2011. But should we label every total eclipse of the moon as a "blood moon?" Not necessarily! How the moon will actually appear during totality is not known. The reason the moon can be seen at all is that sunlight is scattered and refracted around the edge of the Earth by our atmosphere. The color and brightness of the totally eclipsed moon depends on global weather conditions and the amount of dust suspended in the air. A clear atmosphere on Earth means a bright lunar eclipse. But if a major volcanic eruption has injected particles into the stratosphere in the previous couple of years, the eclipse is very dark. Some eclipses are such a dark grey-black that the moon nearly vanishes from view (can we call this a "charcoal moon? "); or glows dimly with a brownish color ("chocolate moon?"). At other eclipses it glows bright orange like a brand new penny ("copper moon?"). So when a total lunar eclipse is due, how come we don’t hear the moon morphing into hues of charcoal, chocolate or copper? Probably because "blood" is more tantalizing and is used by some to try and arouse and provoke fear (and to sell more books). 7) Can total lunar eclipses predict earthquakes? The 1971 San Fernando earthquake (also known as the Sylmar earthquake) occurred in the early morning of Feb. 9 in the foothills of the San Gabriel Mountains in Southern California. The magnitude was determined to be of Richter magnitude 6.7. Fifteen hours later, a total lunar eclipse took place and there were some that suggested that the alignment of the sun, Earth and moon was responsible. Dr. William Kaufmann, who was the director of the Griffith Park Observatory in Los Angeles back then and he noted that, "Today the sun and moon are pulling the Earth in exactly opposite directions. As a result, the Earth is squeezed into the shape of a football instead of a sphere, and we believe that gravitational forces and tidal stresses caused by this alignment are probably what triggered the earthquake." However, there have been many total lunar eclipses in recent history and only a few isolated cases were accompanied by any significant earthquake activity. While the sun-Earth-moon alignment (called a syzygy) might be one ingredient in causing an earthquake, any actual relationship is highly inconclusive. When Christopher Columbus sailed to the New World, he brought with him an almanac written by a great German astronomer, Johannes Müller von Königsberg, known by his Latin pseudonym, Regiomontanus. The almanac covered the years 1475-1506. Regiomontanus' almanac listed upcoming eclipses of the moon. On his third and final voyage in May 1502, Columbus became shipwrecked on the island of Jamaica in June 1503 and ran into trouble with the local natives who refused to provide food and water for his crew. But Columbus also knew from Regiomontanus' almanac that a total eclipse of the moon was expected shortly after moonrise on the evening of Feb. 29, 1504, so he threatened the natives to cut off the moon's light. As the eclipse progressed, the frightened natives agreed to help Columbus ... if he brought the moon back to them. Since he knew when totality would end, Columbus told the natives when the moon would reappear. He had no problems with the natives after that. When both the sun and the eclipsed moon can be observed at the same time we have a "selenelion" or "selenehelion." This can happen only just before sunset or just after sunrise, and both bodies will appear just above the horizon at nearly opposite points in the sky. Although the Earth is positioned directly between the sun and eclipsed moon and seeing both in the sky is a geometric impossibility, it is possible because the refraction of light through the Earth’s atmosphere causes both objects to appear higher in the sky than their true geometric position. 10) 2018: The next lunar eclipse visible from U.S. The next total eclipse of the moon that will be available to North Americans will occur on the morning of Jan. 31st, 2018. Totality will be visible from the western and central portions of the continent, while the East will only see the opening partial stage before the moon sets. After that, the next time all of North America will be able to enjoy a total lunar eclipse from start to finish will be on the night of Jan. 20-21st, 2019. Editor's note: If you snap a great photo of the total lunar eclipse tonight want to share it for a possible story or gallery, send images and comments in to managing editor Tariq Malik at spacephotos@space.com.